Daring Avant-Prog in the tradition of Zappa, Henry Cow, & The Residents. Good luck finding one today. Detroit was safe again, until now. Reporters studio archives, including "Paper Love," a long-lost song intended for the ill-fated double-LP version of RIDIN' ON A BUMMER! 'Bones Chorale' were early Zappa compositions." "Rascal Reporters - Seeking new music and interviewing musicians is a constant journey of discovery for me. Along the way there is the rare and special joy of discovering a previously unknown gem in my own back yard, as it were. I was previously oblivious to the groundbreaking zaniness of The Rascal Reporters, operating since the '70s local to me. In this interview I discuss with Steve Gore about the group; would-be jesters of the RIO movement. This talk includes how working with Fred Frith, Tim Hodgkinson, and other came about. Of course we also discuss the release to CD of Ridin' On A Bummer: Twentieth Anniversary Edition of 'daring Avant-Prog in the tradition of Frank Zappa, Henry Cow, & The Residents.'" click the link on the left to hear the rest of this telephone interview! Thanks to Tom Schulte @Outsight Radio! ridiculous arrangement of Glen Miller's "In The Mood"
I am able to work with her. 'attic door' sound effect generated by my wife, Shawn, at a house we rented in Detroit. The use of this sound was an idea copied from a Univers Zero album, though I can't recall which one at the moment. is playing keyboards, I'm drumming, and Paul Kretzmer is singing, playing bass guitar and (a badly under-recorded) acoustic guitar. result. If I recall, reggae music was big in the mainstream at the time (1977), which seemed to annoy Kretzmer greatly. Steve Kretzmer is playing all the instruments, with the exception of an augmenting vocal track that I added. the Mike Ratledge/Soft Machine song), and didn't switch over to the 'Rascal Reporter' moniker until 1978. We hope to eventually release this concert in full at a future date. Steve Kretzmer is playing Farfisa organ, Steve Gore is playing drums, and Rick Barenholtz is playing bass guitar. The sound quality is absolutely horrid on this piece (even though it is taken from the first-generation master tape), but we wanted to include it because it's so darn cute. I wanted to include a brand-new song on the album, since our upcoming CD release THE MIND BOGGLES is taking much longer than we anticipated to complete. This song was actually originally from THE MIND BOGGLES, but I felt it didn't really fit in stylistically with the other pieces completed for that album. This was recorded 100% digitally, and I think it's interesting to note the difference in sound quality between this and the song preceeding it (1977's "Of Little Value"). I still am a firm believer in analog recording, and I'm not real fond of the 'sterile' feel this piece has (i.e., robots performing rather than human beings). This has a strong 'Hatfield And The North' (particularly Phil Miller) influence. function that I am quite fond of, and this was used extensively in this song. I would like to thank my brother, Greg, who so generously back in 1994 supplied most of the equipment used in this song. We dislike 'drum machines' greatly, so I tried to avoid 'snare,' 'bass drum' and 'tom tom' sounds as often as I could here. The rhythm is carried mostly by a ride cymbal sound. If the means used to create this song is the future of music, we are in deep trouble. "this could be a big hit" right after I finished it, but on subsequent listens, realized some of the chord changes during the verses were just a little bit too left field. At the very end of the piece, I am yelling, "What?" at Steve Kretzmer, which was a common practice at the end of a lot of our songs, as Steve would always look at me like I had made some dreadful mistake during the take. I am proud of the lyric "There'll be a time for me someday" which is a credo I think everyone should genuinely believe in to help keep their life on track. Track 2 - "The Hills"
Where'd you go when the rain stopped pouring? Track 7 - "Bones Chorale"
And tell us what is wrong? Why do we persist in earnest wasting music with this song? Track 9 - "Excerpt From 'Psychlops'"
Track 10 - "Elements (original version)"
Track 12 - "Giraffe Evasion"
Why do they persist in their refusal to see? How'm I gonna run when they keep following me? Parasitic monsters, will they never see? Track 13 - "Reggae On Out Of Here"
Track 15 - "Of Little Value"
Track 17 - "Paper Love"
When will you see? Just you and me? SG: This idea was first suggested to us by Fred Frith, and first used on our 1984 RIDIN' ON A BUMMER LP. It's not a practical process, since the "mail order musician" has to have access to the same recording formats that we use. We don't know how to read or write music out on paper, and almost all the "mail order musicians" we've worked with are "manuscript fluent" so we send them the tracks we have finished on our end, and add an organ line that represents the melody or part(s) we would like the musician to play, then throw the whole shebang onto cassette and mail that out with the actual master tape (the master tape is usually reel-to-reel recorded on a TEAC 2340 4-track, with our parts on tracks #2 and #4, with #1 and #3 left blank for the guest artist to fill in). We then pray the master tape won't be lost by the postal service. We can't afford premium mailing services, so we just cross our fingers. We've never had a tape lost or damaged yet in the 17 years of using this procedure. Depending on the musician, they will either play what we've asked them to play, or come up with their own parts. If the musician is fairly well known, we just ask them to add what they think will work. I was told by Fred Frith that the 'tape-by-mail' process was fairly new at the time, in 1984. I understand it is fairly common now in the digital era. I would have sworn that [Steve] Kretzmer's 'Without Passion or Peace' and 'Bones Chorale' were early Zappa compositions. ...American album rooted deeply in the RIO style with playful tunes, much in the RESIDENTS style, ZAPPA and ART BEARS. Ici, une certaine fraicheur se dégage des compositions assez compliqués mais c'est surtout l'ambiance bizarroide qui en fait une sorte de pépite rare que tout fan de progressif digne de ce nom se doit d'avoir. ...today even more than before, [RIDIN' ON A BUMMER] is a refreshing listening experience. ...lots of playfulness and an instrumental vitality that’s sadly missing in the modern music era. The sound is progressive, fusionesque and quirky, with the Steve's aided nicely by former members of Henry Cow and the Muffins. Originally released in 1984 in a very limited edition vinyl LP, [BUMMER] has become a big collectible, fetching upwards of $100 when you can find a copy... A great addition to the collection of anyone into the more avant-garde side of progressive rock. Fresh like a grapefruit in the face over breakfast. I've just received "Ridin' on a Bummer" a week ago, and haven't stopped listening to it. I wished I'd heard it when it came out, it would've been nice to know there were other freaks writing elaborate music against all odds and commercial realities, and they bring D.I.Y. to a whole other level. The combination of compositional sophistication with handmade rawness makes for some breathtaking listening. And the humour is totally surprising and refreshing in a genre that can often be a downright dour affair. I look forward to discovering more musical mayhem from these misfits. 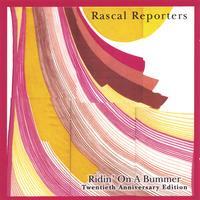 The Rascal Reporters have been making music for over 25 years. This was their 3rd release, but their first on lp. The complexity of the compositions & ideas here will thrill and astonish fans of rehearsal intensive rock. ...groundbreaking zaniness of The Rascal Reporters... would-be jesters of the RIO movement.